I think I may have mentioned quite a few times that I love sunflowers! They make such a presence with their size and cheerfulness that you just have to take notice. They make me happy. :) I don't have much of a green thumb, but I can grow sunflowers. 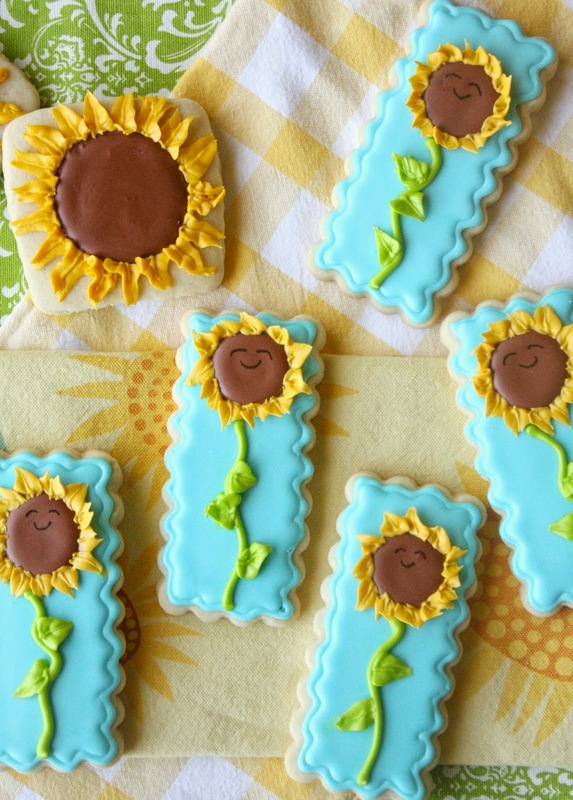 Our sunflower garden from the past and my cookie inspiration. I really need to plant some again ASAP! One happy sunflower with its face turned toward the sun, of course. I made a couple of bigger sunflowers too. 1. Bake cookies according to recipe. 2. Make royal icing according to recipe. 3. Divide royal into four parts, tinting one part blue, one part yellow (gold), one part green and one part brown. 4. Outline and fill the entire cookie with the blue royal icing (#3 tip), and allow it to dry completely. 5. 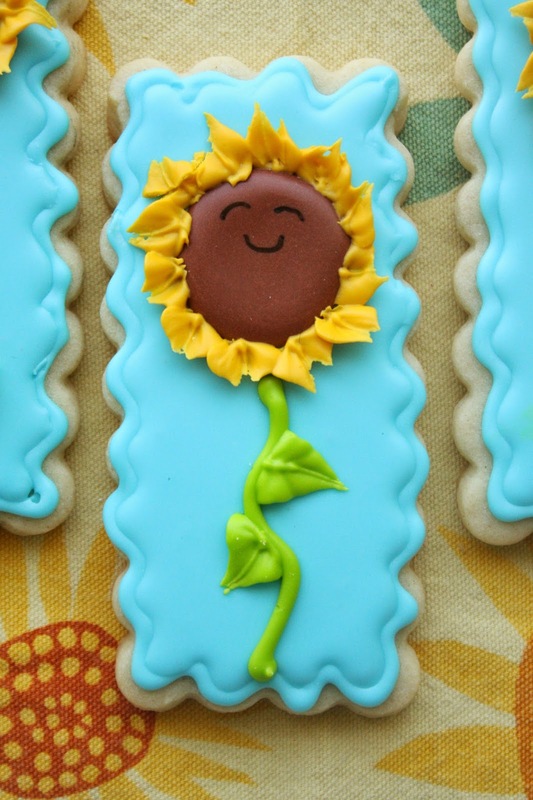 Use a small round cutter and brown food marker to trace a circle for the sunflower. 6. Outline and fill in the brown circles with the brown royal icing and a #3 tip. Let dry for about 30 minutes. 7. Using the leaf tip, and a thicker yellow/gold royal icing, apply the petals around the brown center with the leaf tip (#67). 8. Use the green royal icing (and #3 tip) to make a stem on the flower, and a thicker green icing for the green leaves with the leaf tip. 9. When the brown has completely dried, add the facial details with the black food marker. 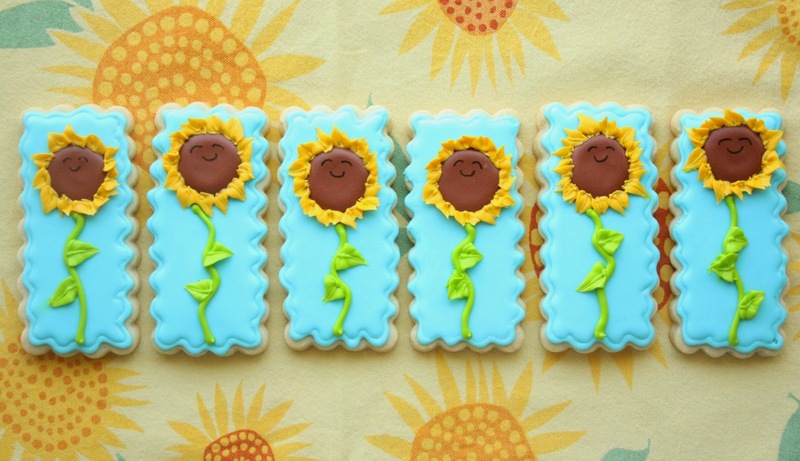 For more sunflower treats, click HERE, HERE, HERE, and HERE. Sue, these are the happiest little sunflowers ever! These cookies are amazing, you are AMAZING, Sue. These cookies are so sweet, especially with their cute smiles. Your cookies are so cute, Sue! Perfect for spring. so pretty! And I bet you grow great sunflowers, always fun when life is the real inspiration!